Step-up multi-factor authentication (MFA) is a dynamic authentication model where the user—either a customer or an employee—is required to perform additional authentication operations, as needed, based on policy. 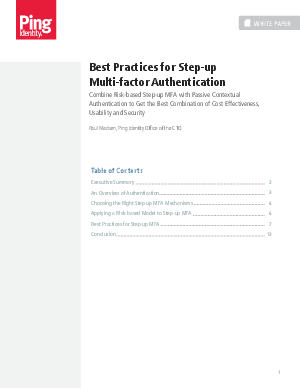 This white paper proposes best practices for customer and enterprise deployments of step-up MFA. It explores a risk-based approach that combines dynamic step-up authentication with passive contextual mechanisms, such as geolocation and time of day.